© KLF Building Products. Nothing from presented (product) information may be used for publication without explicit permission of KLF. 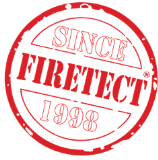 Firetect® is a registered brand of KLF. Considering the complexity of building codes, standards, fields of application and configurations, KLF advises consultation for every (non-)standard or complex site requirement. No rights are implied from provided info. Firetect® is subject to on-going product development. KLF reserves the right to modify or change product specifications without prior notice. Images are for illustrative purposes only; info is provided for guidance only. As KLF has no control over installation methods nor over site conditions, no warranties, expressed or implied, are intended to be given as to actual product performances; no liability whatsoever will be accepted for any loss, damage or injury arising from the use of provided info. Don't miss any of the latest product developments, fields of application etc. We only inform you if it's truly newsworthy!